The VFX AC Drive offers reliable, cost-effective, and user-friendly operation of constant torque applications such as crushers, mixers, mills, conveyors, or any other constant torque application that requires accurate and dynamic speed control. Efficient and protective starts are ensured with Emotron VFX. Reduced start currents, thanks to direct torque control result in smaller fuses, cables, and energy bills. Torque can be boosted to overcome initial peak loads. Integrated vector braking ensures quick and controlled stops, increasing productivity and safety. The direct torque control reacts extremely quickly and eliminates disturbances due to abrupt load changes. A built-in load monitor and a unique Load Curve Protection function protect your process by immediately detecting any situation that could cause inefficiency or damage. Early warning and safety stops for over- and underloads allow preventative action. The compact standalone 2.5 - 250A units are NEMA 12 (IP54) classified. The robust, all-metal construction can be installed close to the application, which eliminates the cost of cabinets and long motor cables. VFX Drives are available for applications thru 2,100HP. The Emotron VFX is available in both NEMA 1 (IP20/21) and NEMA 12 (IP54) configurations. The robust steel construction of the NEMA 12 version means that the drive can be installed close to the application, reducing the cost of additional cabinets and motor cables. The 300 - 1,500A units (NEMA 1 modules) are also available in compact CG-designed NEMA 12 cabinets. The 25 - 244A, NEMA 1 series units are optimized for mounting in control cabinets or on an electrical room wall. Its robust yet compact design allows for easy access to power terminals. Extended temperature range up to 130°F (55°C). 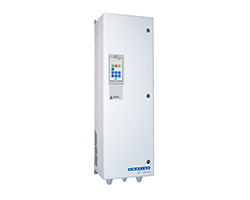 Emotron VFX 2.0 Variable Frequency Drive in NEMA 12 / IP54 configuration. Emotron VFX 2.0 Variable Frequency Drive in NEMA 1 / IP20 configuration. In 1977, Emotron was the first company to introduce an AC Drive based on Pulse Width Modulation (PWM). Further developments led to one of the first market launches of AC Drives with direct torque control in 1998. The Emotron technology has an extremely fast response time, since actual and required torque is compared 40,000 times per second. Emotron AC Drives can provide the highest possible torque per ampre from a normal industrial motor, offering the option of controlling a motor without a rotor sensor while still maintaining control of torque and speed.